The original recipe already had plenty of cornstarch for the filling, so instead of the eggs I decided to try silken tofu. Partly because I had it in the fridge from making crazy delicious vegan brownies earlier this week. As soon as I started mixing the filling, it looked… well, let’s just say I wasn’t expecting much from the finished pie. I continued anyway, and threw it in the oven. Within 15 minutes the apartment certainly smelled like a fantastic Tarte au Citron. I was getting more hopeful. When the crust appeared done, I removed the pie from the oven. Definitely one of those desserts that needs to be chilled before you play with it, I thought. So I let it cool a bit on the balcony in the crisp autumn air, then slipped it into the fridge. Fast forward two hours. I’d just finished up another recipe and decided to check on the lemon pie. Whoa! It looked great! The filling had congealed fantastically. But how would it taste? I cut off a slice, put some confectionery sugar on it – for fun and good looks, at least – and sat down. As the first bite of pie dissolved in my mouth, I felt tremendously happy. Sure, some of it was the sugar rush. But mostly: I was just so pleased to have pulled it off! This vegan Tarte au Citron tastes almost exactly like the original French lemon pie it’s based on. Don’t believe me? Try it for yourself! Add margarine, vinegar, water to large bowl. Mix well, knead to form smooth dough. Melt margarine in a pot on low heat. Blend silken tofu, cornstarch, lemon juice in food processor, or whisk until as smooth as possible. Add to pot, stir. Stir in lemon zest and sugar. Simmer on low until it thickens, stirring constantly, 5 min. Grease a medium pie tin or bake form (about 8 in / 20 cm diameter). Press, spread dough evenly on bottom, pinch up along sides. Poke bottom several times with fork. Pre-bake (empty) crust 7 min. Remove crust from oven and pour in filling. Spread evenly. Bake 30-40 min, until crust is done, surface and edges are lightly caramelized. Allow to cool. Chill for at least two hours before cutting. Garnish with powdered sugar and chopped fresh mint leaves and/or lemon zest. This entry was posted in French, Sweets and tagged dessert, French, lemon, pie, recipe, tarte au citron, vegan. Bookmark the permalink. Is that really 2 tbsp, not tsp, of lemon zest? That’s a huge amount, at least five lemons. Well, it sure sounds like worth all that zesting! It is indeed 2 tablespoons of lemon zest. I usually get 1 tablespoon per lemon using a microplane, which makes really light, fluffy zest. If using a grater (or tiny lemons, like in India) that could make a big difference! I’m sure 1 Tbs (3 tsp) would be fine, too. Ah… the old packed vs. unpacked, sifted vs scooped issue. :-) My zest tablespoons are very unpacked. I’m sure there are official rules and measures for all of this stuff, but I measure most non-critical things fairly approximately, and assume others do, too. I try to also use weights for a more international audience, and they are all checked and measured in the cooking/baking process. But I usually don’t weigh amounts smaller than 1/4 cup, like spoons, or “small bunch of parsely” etc. 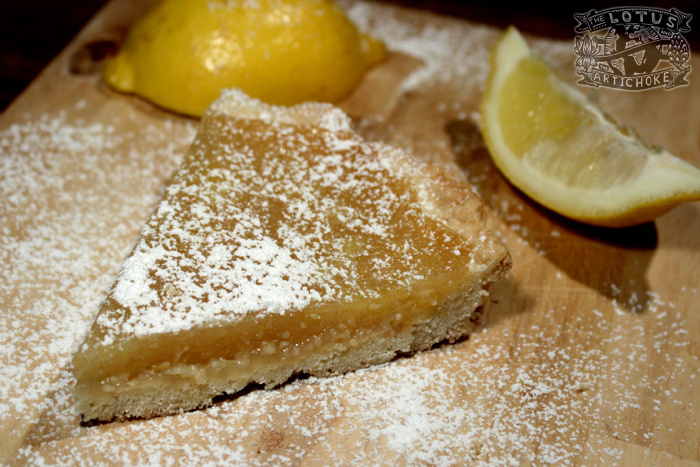 Your tarte au citron looks amazing, Justin! :) Waw! You wouldn’t guess that there is silken tofu in here! That’s a pretty fabulous creation! :) You could put it here in Belgium, in a fancy patisserie! Ooh yeah! And people would be fooled too! Thanks again, Sophie. The silken tofu actually worked out really well, but I had my doubts before it went in the oven as I mentioned in the text. Ha, ha… that’d be funny if this vegan tarte was in a fancy Belgian patisserie and went over well! Die Tarte war sehr lecker und innerhalb von wenigen Minuten restlos aufgegessen! Hatte den Boden nicht vorgebacken, das ging auch. Catrin, das freut mich! Danke! Sehr leckere Tarte. Beim nächsten Mal mache ich glaube ich lieber einen klassischen Mürbeteig, war aber auch so gut und die Giesse, soooo yummie zitronig, mhmmmm… Klasse Idee, danke für’s Teilen!